The appointments to the Disability Advisory Committee are for a three-year term and come after an open competitive process. Eleven people are being appointed with a significant majority of members being people with disabilities. 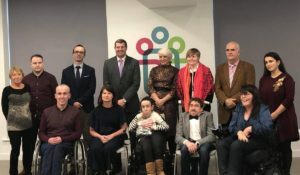 Monaghan County Council is delighted the Irish Human Rights and Equality Commission has appointed its Social Inclusion Officer, Bernie Bradley to the Disability Advisory Committee. Bernie has worked in the area of accessibility and equality for 25 years, working in both community and voluntary sector and public sector. Since 2004 she has worked in the local government sector leading significant cultural and organisational change in equality and accessibility in Monaghan County Council. Bernie has developed numerous policies and initiatives to improve accessibility for people with disabilities that have been implemented in local authorities throughout the country. Bernie holds a Master’s Degree in Public Management and a Professional Diploma in Human Rights and Equality. Bernie’s appointment is a reflection on the significant progress achieved by Monaghan County Council in the area of inclusion, equality and accessibility in the county over the past fifteen years. Speaking on the appointment, Monaghan County Council Chief Executive, Eamonn O’Sullivan, said “I very much welcome the appointment of Monaghan County Council Social Inclusion Officer Bernie Bradley to this very important National committee. It is a recognition not only of the important role performed by Local Authorities across the country, and by Monaghan County Council in particular, but to the many years of commitment that Bernie Bradley has given in her role in the Council as Accessibility Officer and Social Inclusion Officer. I wish Bernie well in her role and I am sure that she will be a very valuable part of the committee for its three-year term”.